Whether it’s a tiny terrace, a small balcony, or a modest little courtyard adjoining your flat, we all deserve an exterior spot where we can relish in some fresh air, open sunlight, and perhaps a few potted plants. 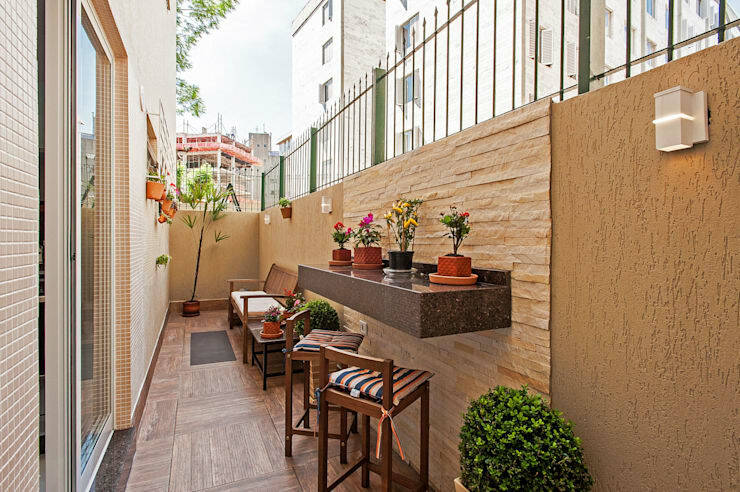 But just because that terrace is barely bigger than your shower does not mean it has to look cluttered and ugly – on the contrary, a small terrace can look most stylish and aesthetically pleasing for half the work and effort it would take to spruce up a spacious one. And, of course, keeping it maintained and clean is much easier too! If your terrace is nothing more than a slim and elongated little space, you’re going to want to save some legroom for walking and moving. But don’t throw out that décor wish list just yet! A wall-mounted surface, such as a floating shelf, instantly offers you a spot to place some decorative elements while leaving the floor open. And if you’re really clever, you can even copy what our designers did in our example above: moving in some stools underneath that bar-like spot to leave ample room and avoid the cluttered look. Think about it: the only floor space that a pergola really takes up is for the four poles. 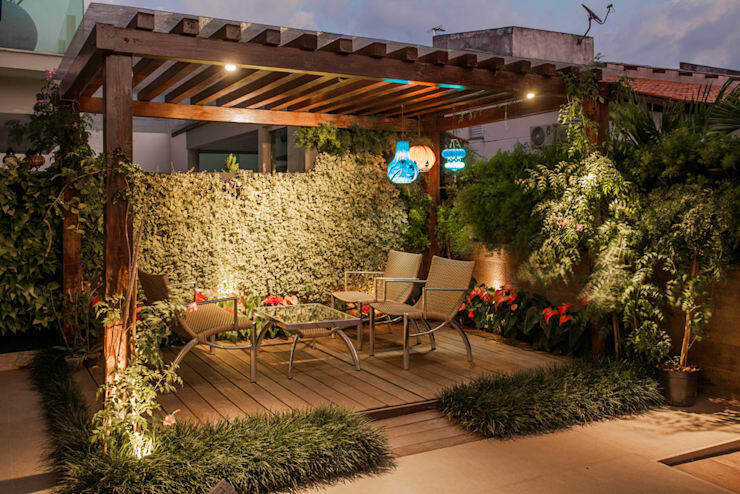 Thus, if your space is so limited that you can’t spare some legroom for a wooden deck, then simply opt for the poles and covered top, and you instantly have a stylish pergola structure in your courtyard/terrace. What décor shall we add underneath? Some throw-pillows and a beanbag? A modest little dining set? How about hanging up a few lanterns and a hammock? If your residence is located a couple of storeys above ground, yet you have a balcony/terrace you can call your own, then you have simply no excuse! 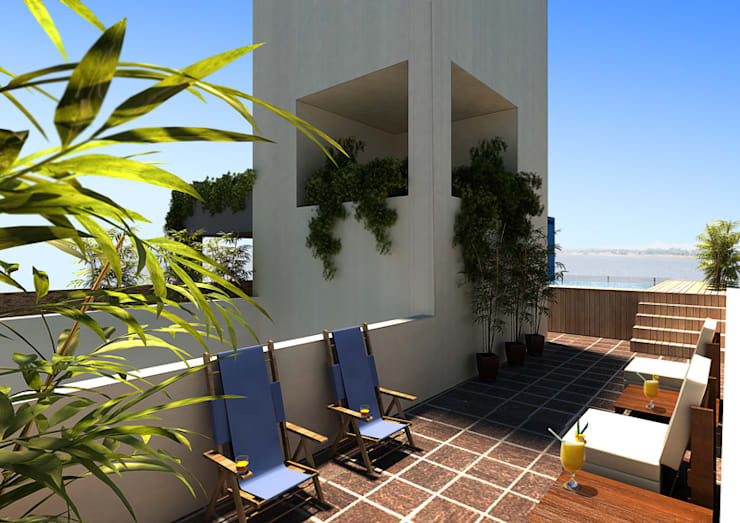 A lounger or two, an umbrella, a few potted plants, a side table – and there you have your very own rooftop spot to enjoy in sunny peace. Wood makes for one stunning floor cover, as well as furniture material, but those aren’t the only features it can add to a home. If your terrace is unfenced (or worse – surrounded by an ugly and tired-looking wall), do the stylish thing: add some wooden panels for a smart touch to form the perfect backdrop for your terrace furniture and décor of choice. Why not? It doesn’t have to be huge (all you need is a space to fit in a grill) or as decadently styled as our example above (although that would be nice, wouldn’t it?). Plus, you know that a braai is the ultimate excuse for an impromptu get-together between friends, especially here in South Africa. In need of an architect? Check out our professionals page for an extensive range of experts in the fields of architecture, design, and much more. 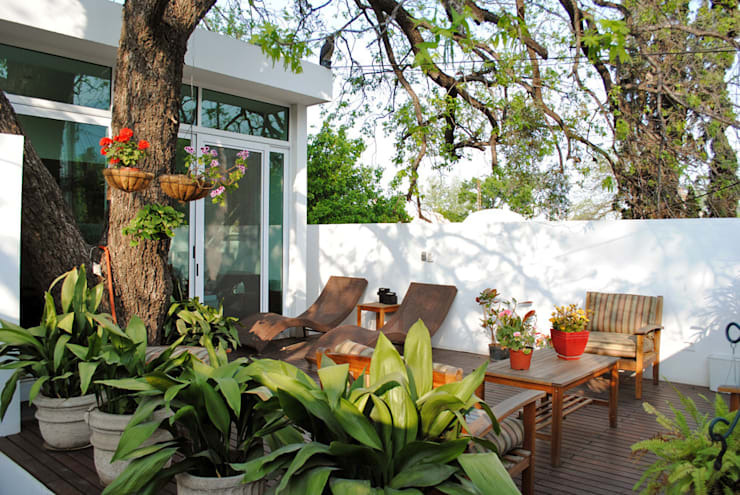 If calmness and relaxation is more to your liking, we have just the thing: a beautiful wooden deck, some lush plants and flowers, and a stylish lounger (or two) where you can spend some quality time with your loved one (or yourself) and a glass of Cabernet. Seeking some more inspiration? 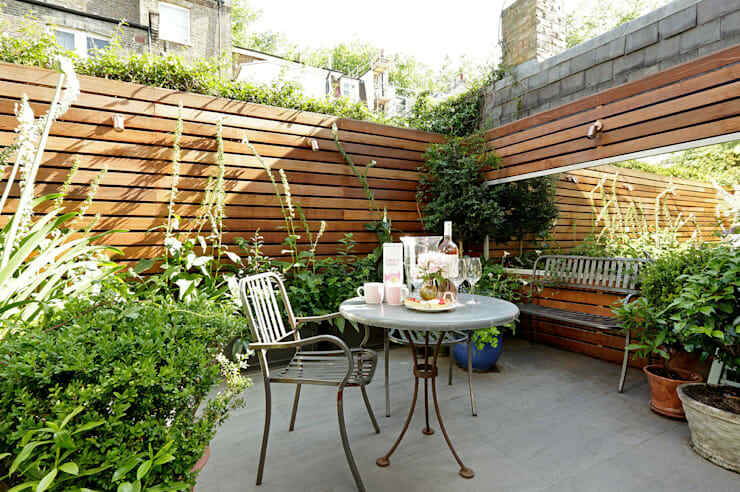 Then feast your eyes on: 7 ideas for a perfect terrace. Which of our ideas will you be incorporating for your terrace at home? Write up a comment below and let us know!